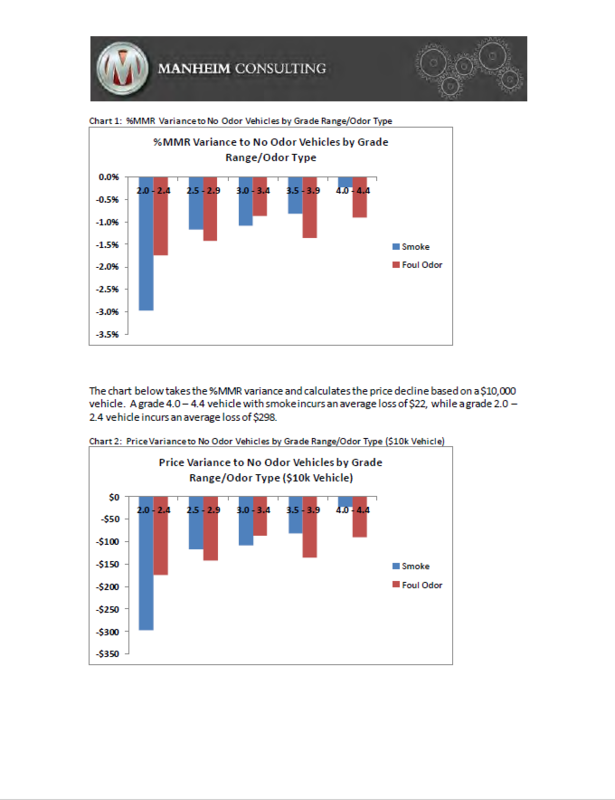 The impact of odor on sale price is highest on lower grade vehicles. Smoke or foul odor may lower retention up to ~3% points (~$300 on a $10,000 vehicle). Auctions offer a rid-odor process that fogs the inside of a car with a chemical and compressed air after detail. The process costs $25. Based on the $300/unit impact to retention, the $25 process has an ROI of $12 per $1 spent. Many consignors struggle with the negative impact vehicle smoke or foul odor has on auction prices. Knowing retail buyers will avoid these units, dealers recognize they may incur additional expense in an attempt to disguise or remove the odor. To help sellers and buyers understand the sale price implications, Manheim Consulting quantified the auction price deterioration caused by condition-report-noted odor and highlighted ways to come out smelling like a rose. Download the PDF below or watch this video to learn about the many reconditioning services offered by Manheim. See the full report to understand the sale price implications caused by condition report noted odor.